quick and dirty : SMODE actually support mapping to Note True/False and to Note Velocity. Would be nice to map to MIDI note number as well. 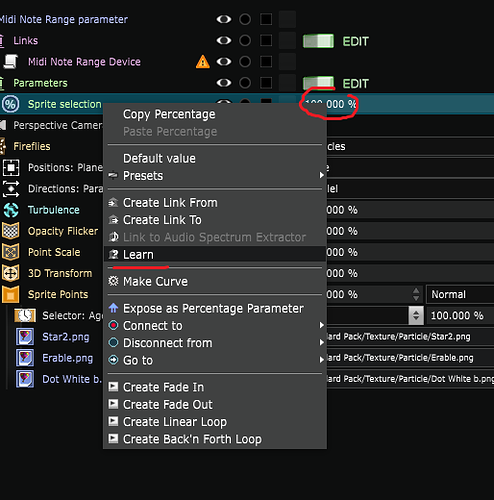 You can do that today already, using the "Midi Note Range" device source, and an exposed parameter. It's an experimental device so it's a bit hidden in the GUI. 2 - Choose the thing you want to change through MIDI input. Here, I chose the activation of different layers in the sprite point renderer of my particles. 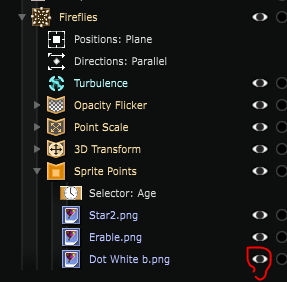 Right click on it > Expose as percentage. 5 - Select the link and change the device link source to "Midi note range device"
6 - Activate HOLD and put the values of your notes (lower and highest). Here I want the 8th note to show the first sprite, the 9th the second, and 10th the third. By putting from 8 to 10 I tell it: 8 = 0%, 9=50% and 10 = 100%. That way, you can change pretty much everything, from the seed of a noise to the activation of objects, a color or event text. By the way, I tested all that in the 7.6.970 release. If you have that one or a later one, everything should work. I think it's available in all 7.6 versions, but if you don't find the "Midi Note Range device" check your version of Smode and tell me about it ! Thank you very much Martin !